Everyone loves puppies and what's not to love with Great Impression F578 Scott Rubber Stamp? 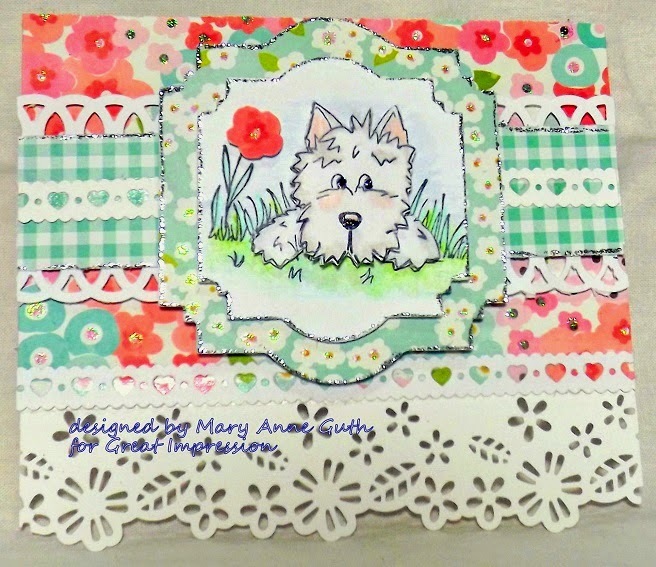 For this card I added some grey high lights to my white puppy and a little pink in his ears. I also gave his nose and the blacks of his eyes a little bit of Stickles. The puppy is actually stamped three times and two of the images are popped up to give him dimension. Instead of the cute little tulip that is part of F578 Scott I covered the blossom with a matching flower from the design paper. This pup is perfect for any occasion and will be sure to win a few hearts. This is so sweet. I love the punched bottom and the pretty colors of all the paper you chose!